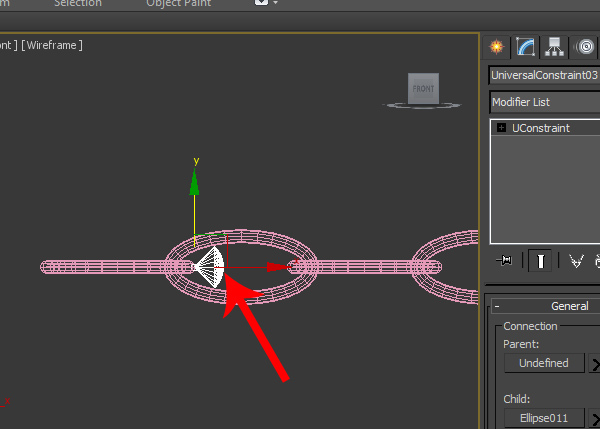 Open 3ds Max. 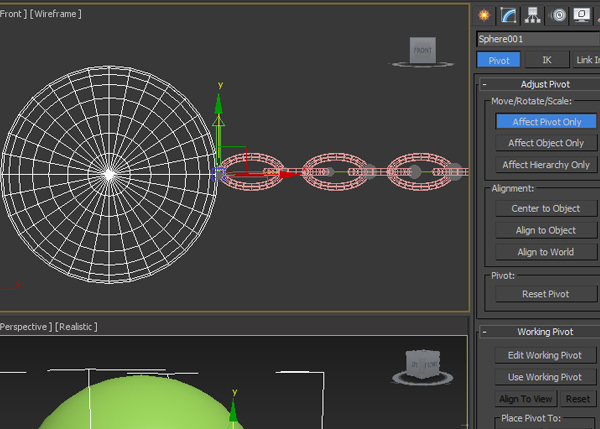 Go to Shapes > Splines > Ellipse and draw an oval shape in the front viewport. 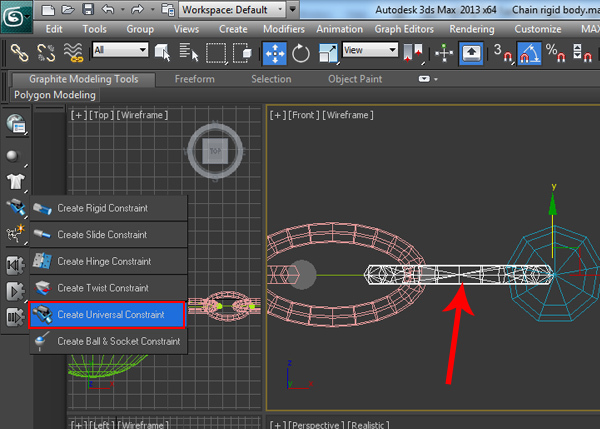 With the oval shape selected, open the Rendering rollout tab. 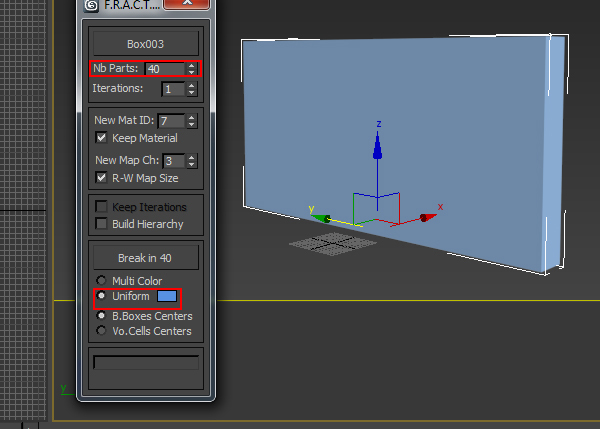 Turn on Enable In Renderer and Enable In Viewport options. Increase the Thickness value to 7. 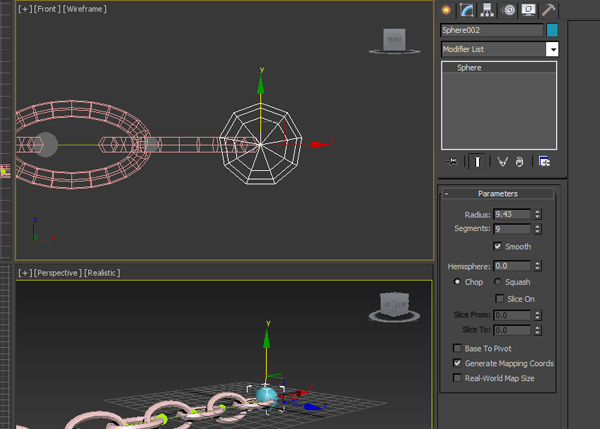 Right click on the oval shape and turn it into Editable Poly. 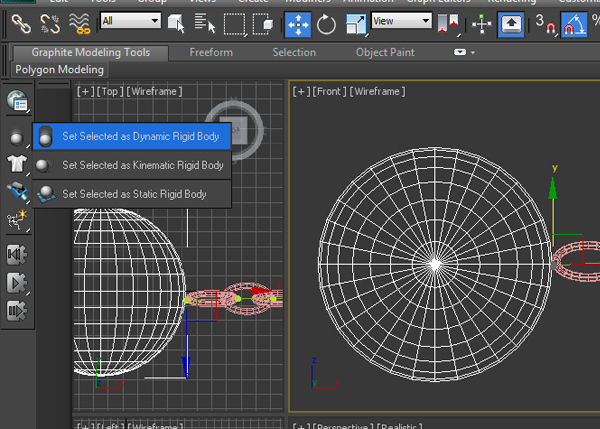 With the oval poly shape selected, click on Hierarchy panel. 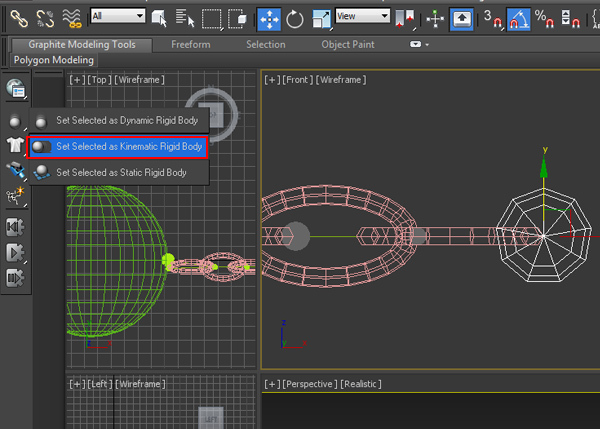 Enable Affect Pivot Only option and drag the pivot of the oval poly shape to the extreme right. Don’t forget to turn off the Affect Pivot Only option after that. Make a copy of the oval poly shape and rotate it. Both objects must not intersect each other. Make several copies of the oval shapes to form a chain link. 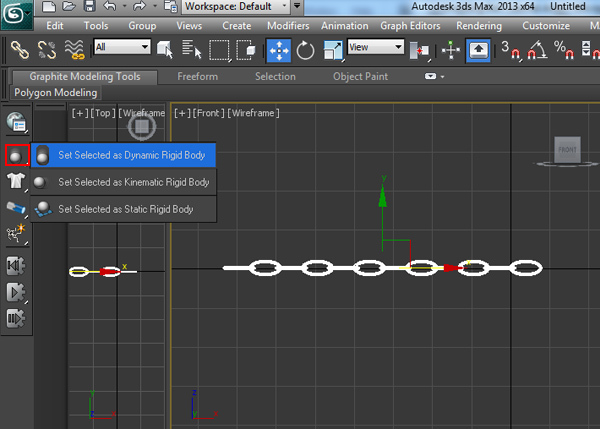 With the chain selected, go to Mass FX toolbar and select Set Selected as Dynamic Rigid Body option. 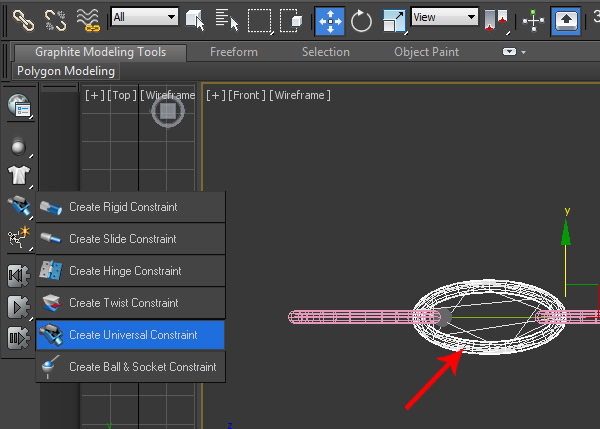 With the first oval poly shape from the left side selected, go to Constrains > Create Universal Constraint. It creates a UConstraint at the pivot point of the oval poly shape. 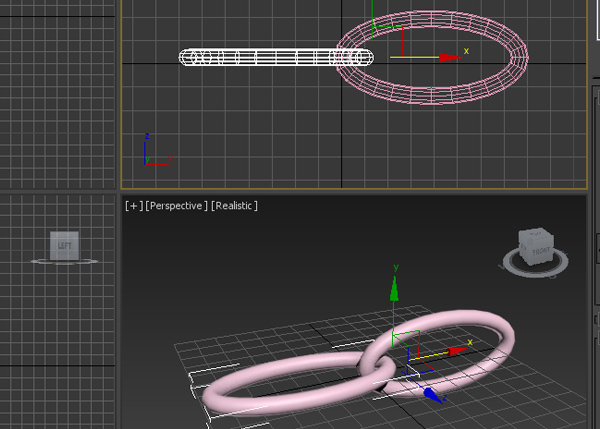 For the first oval poly object, its parent would be the next oval poly object. Click on Parent tab and select the next oval poly object as the parent of the first oval poly object. Turn onFree radio buttons of Swing Y, Swing Z and Twist properties. You can lower the UConstraint icon size also. Put a smaller value in Icon Size. 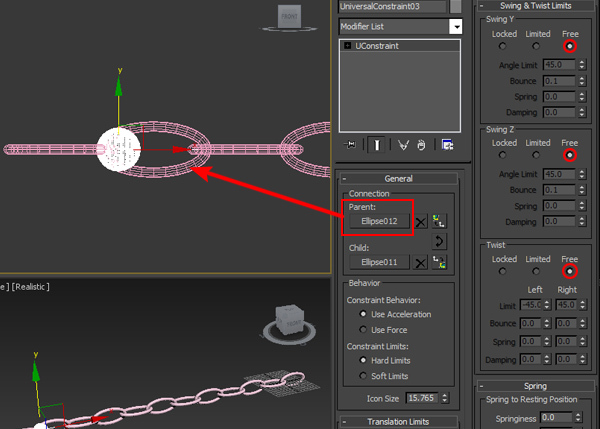 Following the same way, with the next oval poly object selected, go to Constraints > Create Universal Constraint. For this oval poly object, its parent would be the next oval poly object. So, click on Parent tab and select the next oval poly object as the parent of the selected oval poly object. Turn on Free radio buttons of Swing Y, Swing Z and Twist properties. 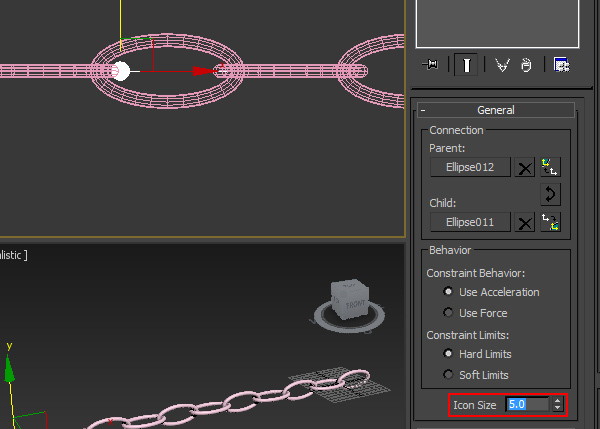 Following the same way, keep making constraints for each oval poly object one by one. 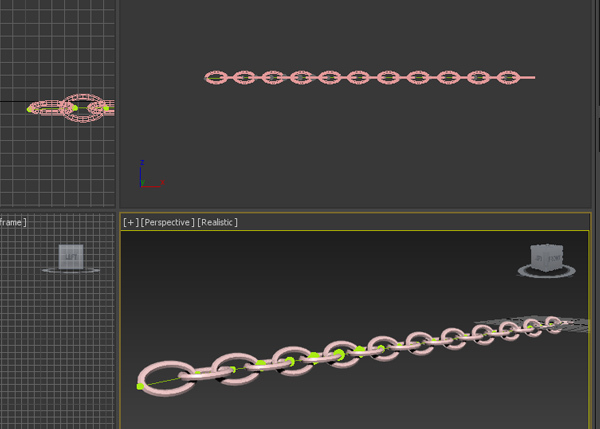 After a couple of minutes, you will have the completed chain. Create a sphere. Put it at the end of the chain link. 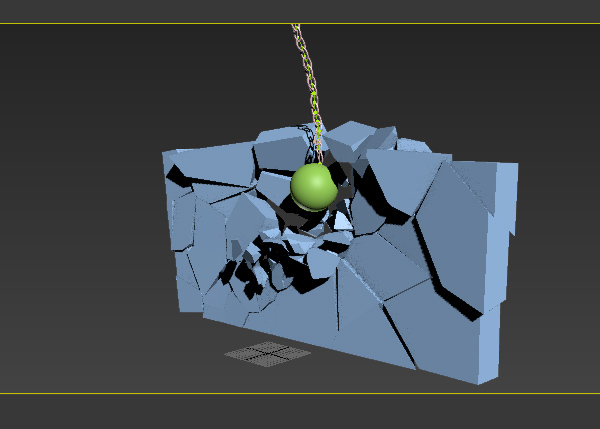 This will act as the wrecking ball. 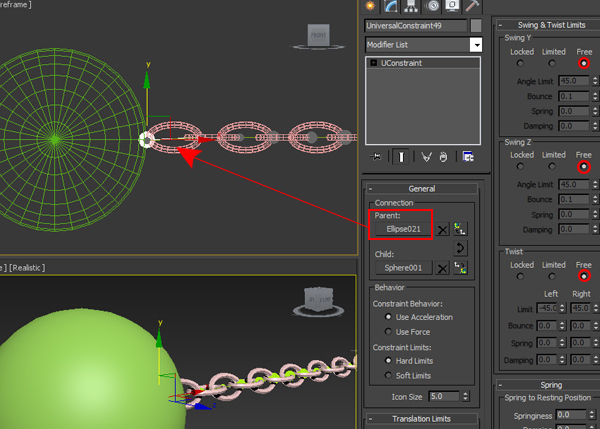 Put the pivot of the sphere at the edge of the sphere as shown in the following image. 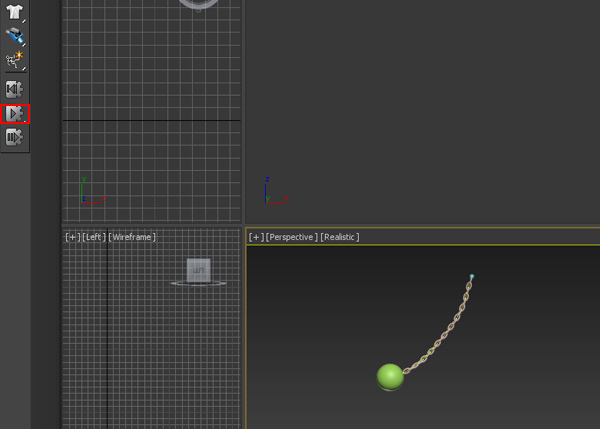 Make this sphere as a dynamic rigid body. 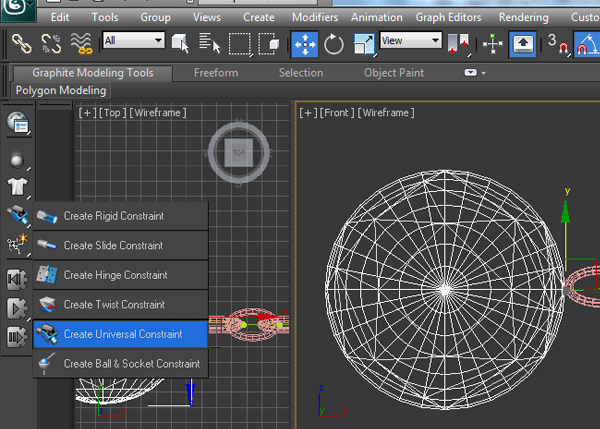 Apply Universal Constraint to the sphere. For this sphere object, its parent would be the first oval poly object. 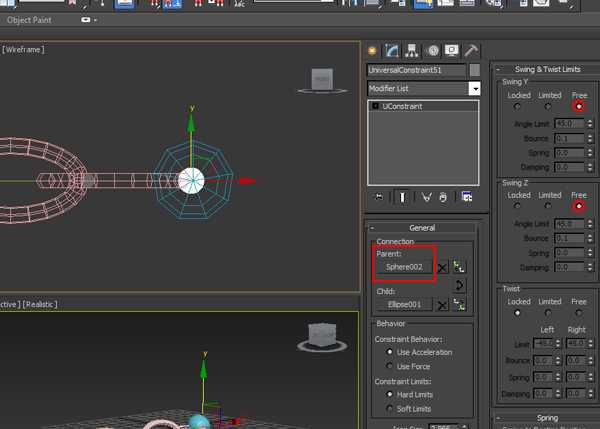 Click on Parent tab and select the first oval poly object as the parent of the selected sphere object. Turn on Free radio buttons of Swing Y, Swing Z and Twist properties. 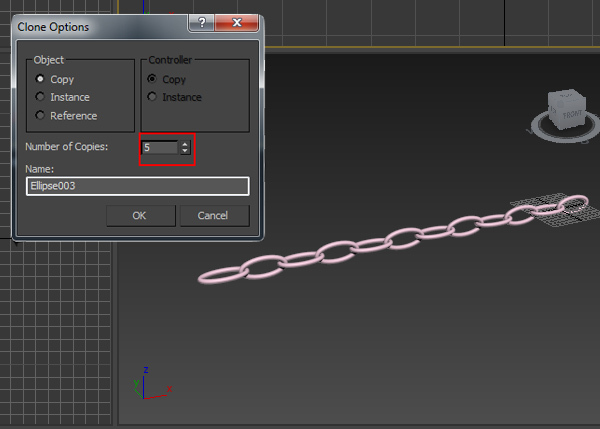 Create a small low poly sphere at the extreme right end of the chain. 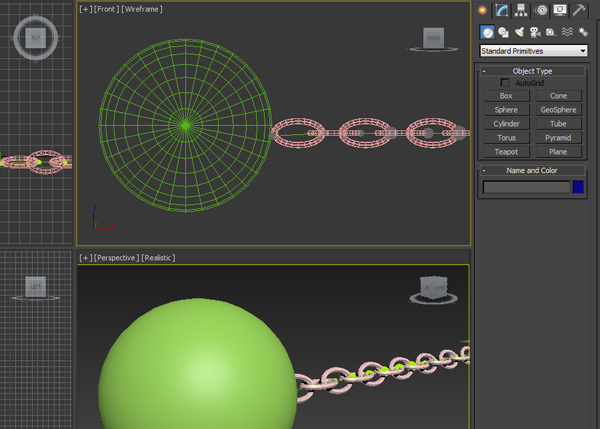 This time, make this sphere as a Kinematic Rigid Body. 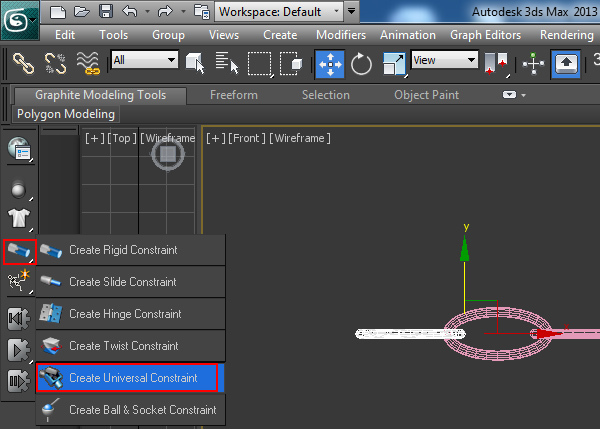 With the indicated oval poly object selected, apply Universal Constraint to it. Select the low poly sphere as the parent of it. Turn on Free radio buttons of Swing Y and Swing Z. Keep the radio button of Twist turned off. 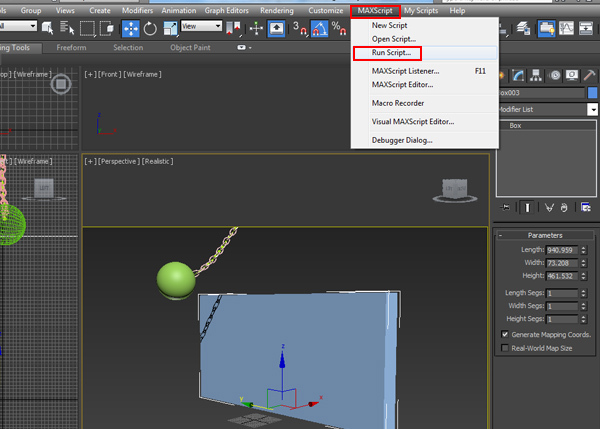 With the wrecking ball sphere selected, click on Mass FX Tool icon. 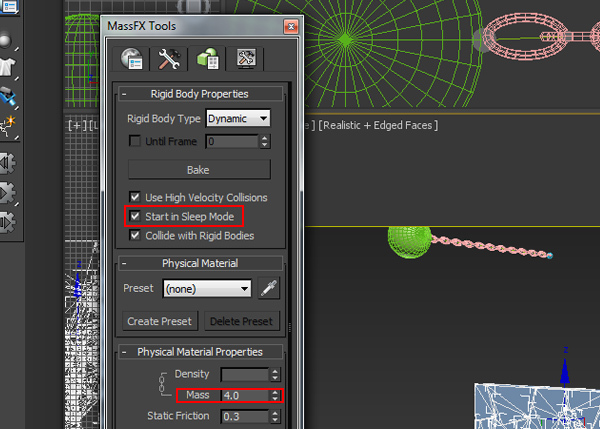 Inside the Mass FX Tool window, go toMulti-Object Editor tab and put the Mass value as 5. Click on Start Simulation icon. 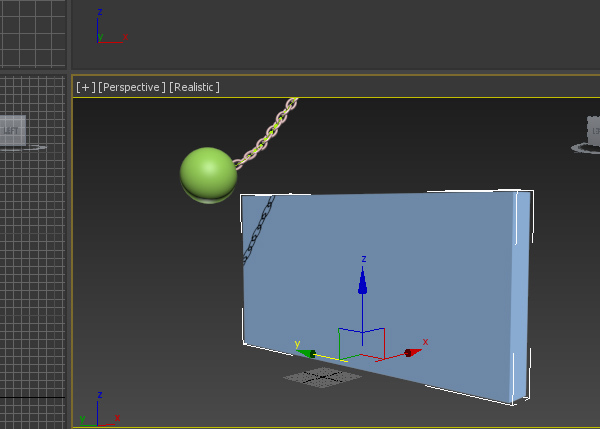 You will see a fine simulation of chained wrecking ball in the viewport. 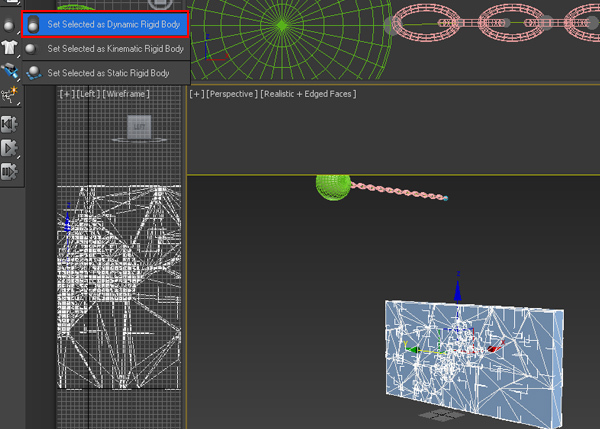 Go to scriptspot.com and download Fracture Voronoi script. 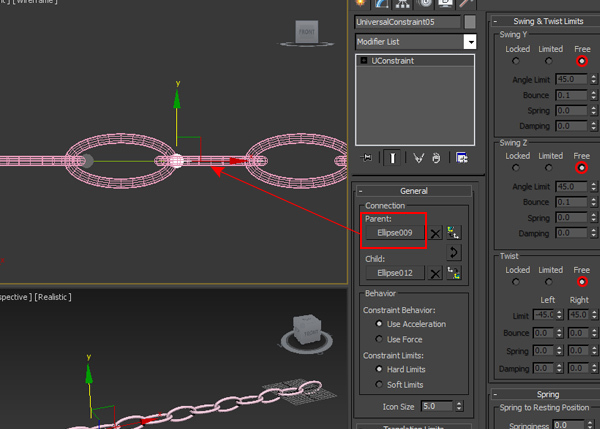 Save the script in the 3ds Max Scripts folder. 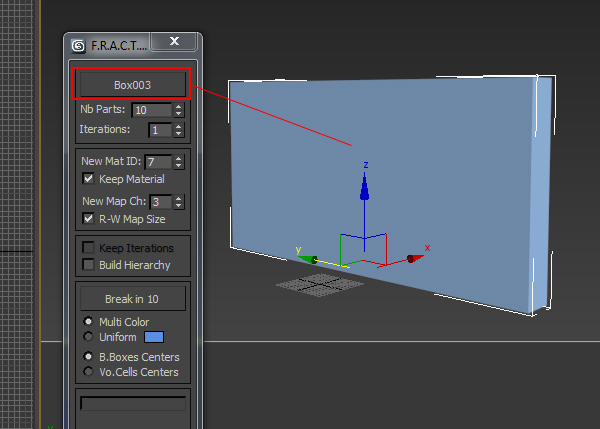 Create a box in the viewport to make a wall. With the wall selected, go to Max Script > Run Script. It opens the Choose Editor file window. 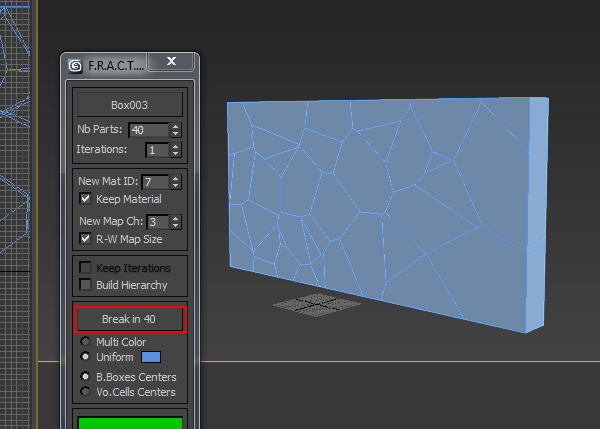 Select the Fracture Voronoi script and click on Open. 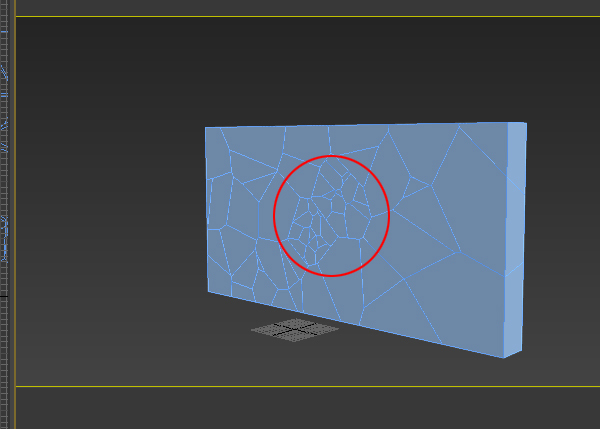 It opens the Fracture Voronoi script window. 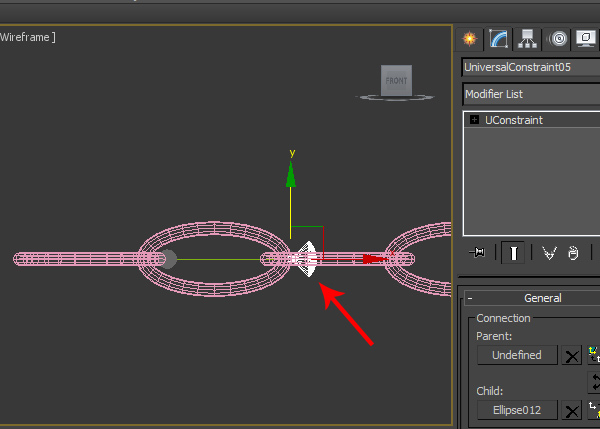 Click on Pick Object button and then select the wall in the viewport. I have set the Nb parts as 40 since I want the wall to be broken into forty different chunks. I’ve selected theUniform color option as I want all the chunks in a same color. Click on Break in 40 button. It breaks the box wall into 40 pieces. You can further break each broken piece into several more chunks. Select a broken piece and then repeat the process from Steps 2 to 6. With all wall chunks selected, make them as Dynamic Rigid Body. 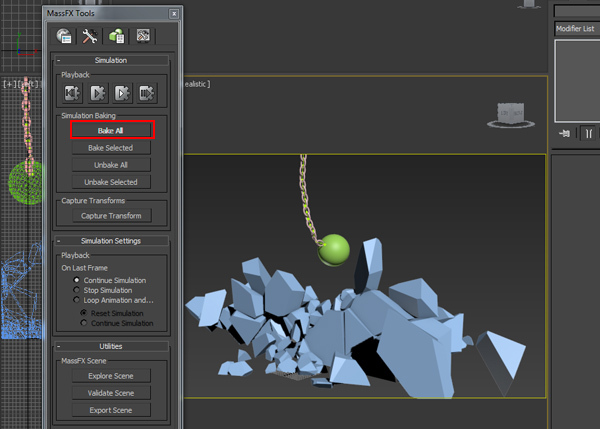 With all wall chunks selected, go to Multi-Object Editor tab and put the Mass value as 5. Turn on Start in Sleep Mode option. Click on Start Simulation button. You will see the wall shattering simulation in the viewport. Once you are satisfied with the simulation result, click on Bake All tab to bake all simulation. 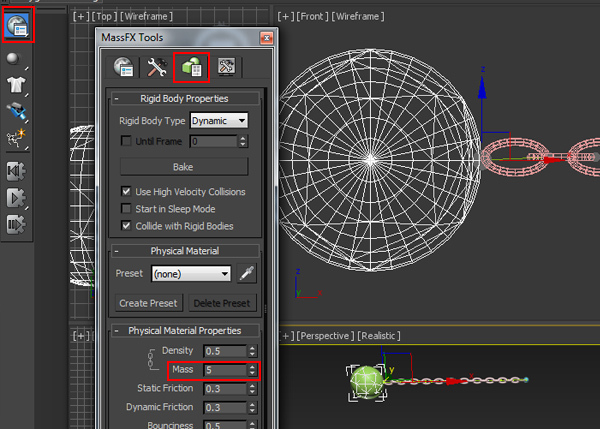 Mass FX is a great dynamics tool in 3ds Max. It has replaced Reactor and has more controls over the dynamic simulation than ever.